In an earlier tutorial, I had introduced you to two essential tools for cracking online passwords—Tamper Data and THC-Hydra. In that guide, I promised to follow up with another tutorial on how to use THC-Hydra against web forms, so here we go. Although you can use Tamper Data for this purpose, I want to introduce you to another tool that is built into Kali, Burp Suite. So, let's get started. Fire up Kali and open THC-Hydra from Applications -> Kali Linux -> Password Attacks -> Online Attacks -> hydra. We can identify each of these using a proxy such as Tamper Data or Burp Suite. Although we can use any proxy to do the job, including Tamper Data, in this post we will use Burp Suite. You can open Burp Suite by going to Applications -> Kali Linux -> Web Applications -> Web Application Proxies -> burpsuite. When you do, you should see the opening screen like below. 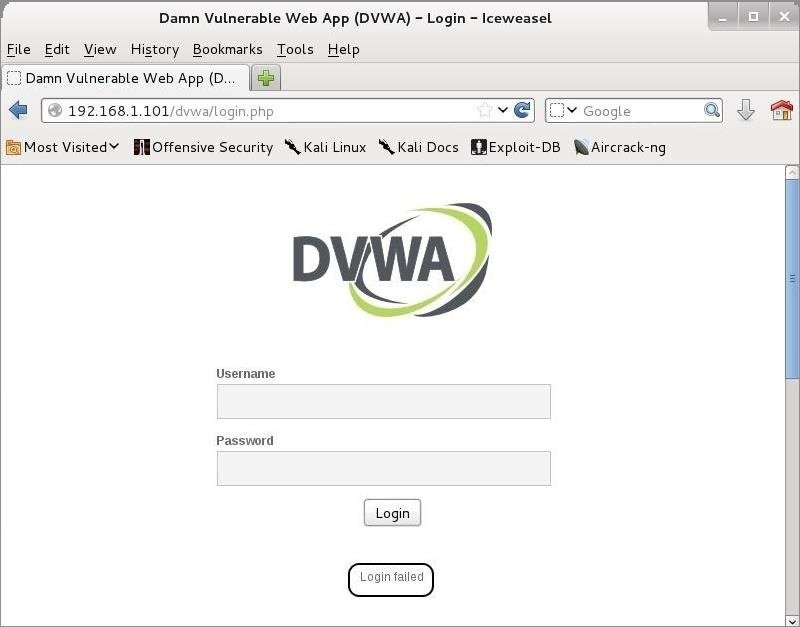 Next, we will be attempting to crack the password on the Damn Vulnerable Web Application (DVWA). You can run it from the Metasploitable operating system (available at Rapid7) and then connecting to its login page, as I have here. We need to enable the Proxy and Intercept on the Burp Suite like I have below. Make sure to click on the Proxy tab at the top and then Intercept on the second row of tabs. Make certain that the "Intercept is on." Last, we need to configure our IceWeasel web browser to use a proxy. We can go to Edit -> Preferences -> Advanced -> Network -> Settings to open the Connection Settings, as seen below. There, configure IceWeasel to use 127.0.0.1 port 8080 as a proxy by typing in 127.0.0.1 in the HTTP Proxy field, 8080 in the Port field and delete any information in the No Proxy for field at the bottom. Also, select the "Use this proxy server for all protocols" button. Now, let's try to log in with my username OTW and password OTW. When I do so, the BurpSuite intercepts the request and shows us the key fields we need for a THC-Hydra web form crack. After collecting this information, I then forward the request from Burp Suite by hitting the "Forward" button to the far left . The DVWA returns a message that the "Login failed." Now, I have all the information I need to configure THC-Hydra to crack this web app! Getting the failure message is key to getting THC-Hydra to work on web forms. In this case, it is a text-based message, but it won't always be. At times it may be a cookie, but the critical part is finding out how the application communicates a failed login. In this way, we can tell THC-Hydra to keep trying different passwords; only when that message does not appear, have we succeeded. A few things to note. First, you use the upper case "L" if you are using a username list and a lower case "l" if you are trying to crack one username that you supply there. In this case, I will be using the lower case "l " as I will only be trying to crack the "admin" password. After the address of the login form (/dvwa/login.php), the next field is the name of the field that takes the username. In our case, it is "username," but on some forms it might be something different, such as "login." Now, let's put together a command that will crack this web form login. Now, let's build our command with all of these elements, as seen below. Step 8: Let Her Fly! Now, let her fly! Since we used the -V switch, THC-Hydra will show us every attempt. After a few minutes, Hydra returns with the password for our web application. Success! I recommend that you practice the use of THC-Hydra on forms where you know the username and password before using it out "in the wild." Keep coming back, my hacker novitiates, as we continue to expand your repertoire of hacker techniques and arts! Great tutorial! I was wondering if this makes alot of noise on the server, and if it does, is the wait function the best way to prevent it? I always run into getting locked out, or ip banned! Any cool tricks you could share? Thanks again OTW, for another great tutorial! How do I find the IP address? I don't see it anywhere in the burpsuite pics? There are sites that doesn`t let you use burpsuit against them --> how can i bypass that , or if it is impossible can i use page source instead ???? I was right! It is -w! Good article, but wouldn't it be more practical to use Burp Intruder since we are already going to be using it to intercept requests and responses. Also I have encountered instances of hydra throwing false positives against POST forms as well as Telnet, any thoughts on this? Do you mean brute-forcing the account? Or as you describe "killing" the iPhone? yeah URATTACKER i'm curious what do you mean by "Killing " iphone? OTW any thoughts on my statement from before? No i was asking about Hydra throwing false positives for web forms and telnet? Does it occur frequently because i have faced instances where where hydra throws like two or three valid user names and passwords for a web form or telnet and then when i put them in they are not valid. Yes, it sometimes throws false positives. With web forms, it is totally dependent upon the "failed login" message that you use. If it doesn't see that, it will give you a false positive. In addition, if you slow it down with the -W switch, you will get fewer false positives. Thanks! as usual great help. Gonna go check out your python articles. One more thing as far as the failed login message is that from the response headers or am i just looking for what is displayed on the page after a failed attempt HTML, Pop up, etc.? There is a vulnerability in the snapchat app for iphone that allows a hacker to perform a denial-of-service attack that can even crash the iphone. 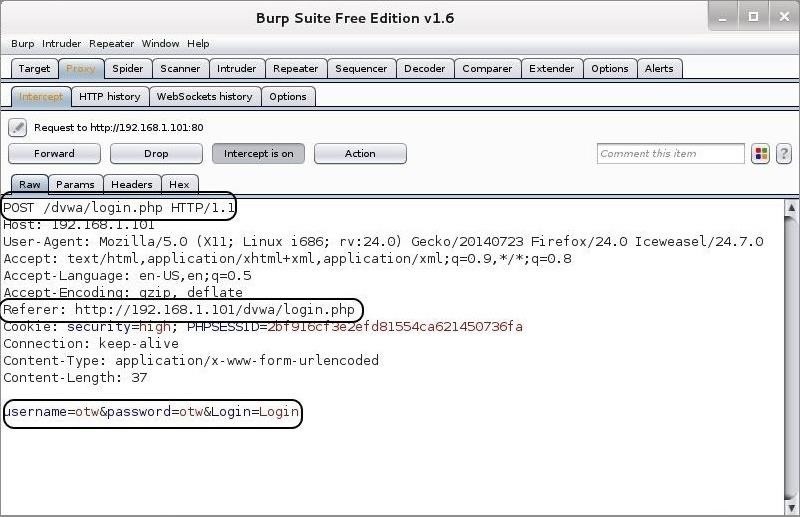 You can use burp to exploit the vulnerability. Yes you can use burp intruder to perform brute force attacks on usernames and passwords. Much like everything else there is more than one way to do just about anything. OTW simply showed you one of them. Hey, sorry beginner here, how do I get the proxy of the site through metasploit like I got the main page but not the login one. I think you are asking how to get the login of "Metasploitable"? It's at the IP/dvwa/login.php. Hey, as always thanks a lot OTW for all the information. I just have 2 questions which if you could answer would be greatly appreciated. 1.THC-Hydra is a brute force, and I suppose it won't work on Gmail, Hotmail or in fact any such sites? If not what tools are there that will? 2.Android, an open sources mobile OS has already Kali and backtrack running right from the App store itself, only rooting is required. Can you do a tutorial on its uses and limitations too? last time i tried brute forcing gmail it blocked me like after 500 attemps, do you have a method to pass the block otw or know how`? you dont think you have wrote a atricle about it, maybe you should? Anytime you are trying to hack a site with a lock out, dictionary or brute forcing is the wrong tool for the job. You should always give social engineering first priority b4 tryn brute force.. Ucan always use phising sites but the quiZ is how du u get the victim get lured by ur trap... U need to spoof gmail maill. Lets say pretend ts an email from google telling them to modify password or sms spoof using the google numbers..
so i generated a custom wordlist just for that spesific situation with crunch. now i just need to know the combination. But every website the victim are using has https and will proberly block me. How should i find out the combination then? Isn't there a way to slow down the attack so the website not are blocking me? cuz i would have the time to wait a little longer than. hacking small useless websites, that nobody have in mind to use anyway doesn't help me to crack the big sites. As the article says, you can use the -w switch to slow the attack. Hope that helps. 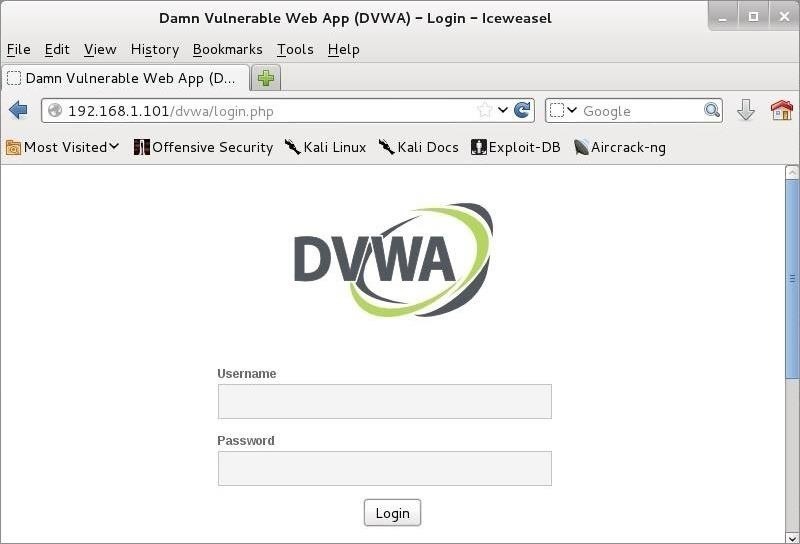 If DVWA is running on your Kali system, use 127.0.0.1. Hey! I'm trying with a different website which has an http-post-form like this " /Login.aspx?ReturnUrl=%2f" but when I type in the command it says "Wrong syntax, requires three arguments separated by a colon which may not be null: /Login.aspx?ReturnUrl=%2f" Idk what to do. Hope you can help. You need to add the variables into the form. Download it, extract it, run it. If it doesn't work on Java 8, try Java 7. 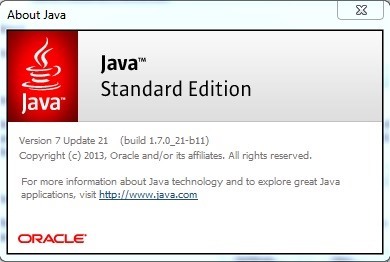 Java 7 .after click on it nothing happen except opening cmd and closing once. Followed this tutorial to the T, but I'm still having issues. I keep getting "1 of 1 target successfully completed, 5 valid passwords found" (see below) when only ONE of those passwords is actually the valid one. I'm trying this against a local Joomla 2.5 site on my home server. "Username and password do not match or you do not have an account yet." is the failed message that pops up, though. "Getting the failure message is key to getting THC-Hydra to work on web forms. In this case, it is a text-based message, but it won't always be. At times it may be a cookie, but the critical part is finding out how the application communicates a failed login. In this way, we can tell THC-Hydra to keep trying different passwords; only when that message does not appear, have we succeeded." So you're saying even if a text-based message pops up, it may not be the way a failed attempted is communicated? How would we indicate on the CLI if it's cookie based then? You are getting ahead of yourself. First, find out how the application communicates a failed attempt. Have you figured this out? 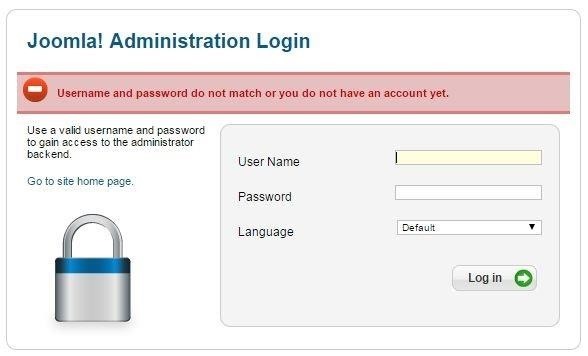 Did you try "Use a valid username and password to gain access to the administrator backend"? I'm sort of struggling with this too. Did you try using "Use a valid username and password to gain access to the administrator backend"? I read somewhere about using the cookie data to flag a failed response but not sure how to implement that. I've been using the tamper data addon for years. It was the first thing I tried. I'm able to get this to work on most routers. However, the problem on my router is that I cannot figure out the format of adding the username and passwd to the url bar. Thats all tamper data / burp suite shows. I've tried adding it after the /check.php and nada. Hello World! hehe, im so funny. Jokes aside, I do have a question. I have been following your tutorial and have installed DVWA locally on kali linux (Dual booted) and when I setup the proxy on Iceweasel, I cannot load any pages, not allowing Burp Suite to access any of the needed information. It loads for a bit, than quits. I took a picture of my proxy settings but it was to big so I put a link to it below. Also, sorry if this is the most obvious thing, im tired and have been at this for a while. Sorry for LQ, couldnt take a screenshot for a reason and used my phone. Hey OTW, really well explained tutorial, I have a question though : should I use proxy with hydra if I want to crack password for ONE account let's say my friend's Facebook account? Will I get an ip ban or something like that ? And BTW , I really want to know if you could make a tutorial on how in Mr.robot episode 1, Elliot hacked his psy's password by simply adding custom word to a dictionary and instant cracking. I know you can do it with crunch but it is only creating wordlist. Hey OTW ! Your tutorials are vey well explained and I'm learning a lot. Could you please tell me if I should use a proxy list in order to crack an online account with crunch and hydra ? And can you teach us how did Elliot cracked his target's password in episode 1 of Mr. Robot ? They way he adds password to a password list and instantly run the brute force . I'm waiting for your answers , thank you . or do you have any tip on how to auto change ip addres in kali linux ? So I was tryin to brute force a yahoo email , so I tested it first with my real email and made a .txt word list with 5 passwords and one of them was the right one and the other 4 weren't. hydra checks all of the 5 words and says that all were invalid and no password was recovered even though the 3rd was my password, what my be happening? You are missing probably the most important part of the Hydra command, the last section. That section defines how the server communicates that the password was wrong. You didn't include it. so what should I add to the end of the script? can you give me an example? Hydra -l (my email) -P (my wordlist) -s 465 -S -v -V -t 1 smtp.mail.yahoo.com smtp - than whats the next part? Please go back and re-read this article. There are several errors in your command. Great tutorial. I managed to get something similar to work on a test VPS I use to attack. The issue however is that the auth.log file shows my IP when simply using hydra. "hydra -s 22 -v -V -l root -P /usr/share/wordlists/testlist.txt -t 4 -w 60 SERVERIP ssh HYDRA_PROXY=socks5://121.40.102.199:1080"
"proxychains hydra -s 22 -v -V -l root -P /usr/share/wordlists/testlist.txt -t 4 -w 60 SERVERIP ssh"
"reverse mapping checking getaddrinfo for MYHOMEIP failed - POSSIBLE BREAK-IN ATTEMPT!" Can you explain why it has my home IP some how via "reverse mapping? My proxychains list has about 15 proxies in it using dynamic_chain. Im very confused. While setting up Burpsuite and Iceweasel I did everything you stated and after that every page will result into unlimited loading........ and Burpsuite seems to only get the GET request or parts of it. Of course when I put the proxy off in Iceweasel everything works perfectly fine. Fixed it by going to options and enabling all the 'Intercept Client Request'. I am not sure what words are useless in the string? Its just the IP/login.cgi as header. Hey, great tutorial. I follow those steps, but something is still wrong (I get 16 valid password, from which mine is none) and I don't really know what it is. Also my console shows me those "signs" instead of letters. I never encountered that before. I get the same exact thing anyone know why and how to fix it? Thanks for a awesome post. THC-Hydra is the wrong tool. 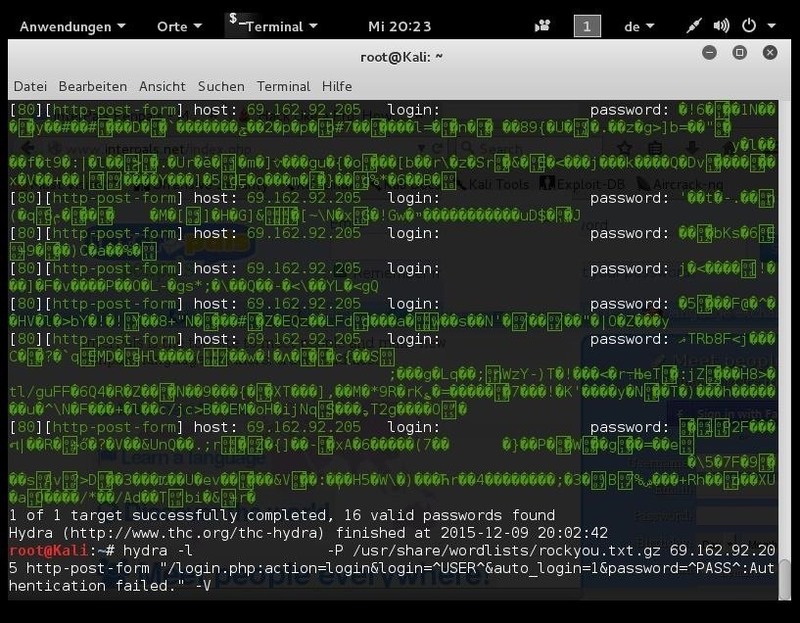 Try using aircrack-ng for hacking the passwords on your WiFi router. no i'm hacking the web login of my router not the wifi password. Thanks for the reply! OTW, I tried to crack my own password and everything was going ok, but THC-Hydra didn't stop when the correct password was attempted. The password was found, but Hydra do not show it! Notice where the username and password appears in this tutorial. What does it say there when you run THC-Hydra? In my case the "password : password" is not there. It says right there that it found the password "password" for the admin user. How can I help you when you have obscured all the key information? Did I? Sorry. I did because the target is a website and the login is my own account. I just have two questions: What about if I know that the username's password is written in another language, with maybe 2 numbers. Should I use kali linux wordlists? Or should I create my own wordlists with crunch? And how do I find the wordlists and passwordlists using the terminal? If you know username and password then find wordlist with terminal use this command "locate wordlist" or "locate rockyou" (Kali Linux) then open with text editor and find if there or not .. you can add in list if not found. Try everything (http-get-form, http-post-form, use Cookie,...) but not works. How can I use Hydra... "and hack like pro"? Thanks for the useful guide. However i dont manage to succeed. Some help would be appreciated. Below a print of Burp results and the command line in Hydra. Hydra tells me after 'enter' the syntax rules but does not start the job. Also : i use Hydra with Cygwin on Windows 7. Does it matter from WHERE i start the hydra command, i mean should i do it while being in the hydra dir, or should it be the cygwin dir or just the root dir C ? Wrong username and/or password. This is the fail message of the site. Great tutorial. However, I do not think this technique will work with a particular router I have. The router's login page uses a Java applet. Any idea how I can approach cracking the password. Using hydra SSH gives me an error of password authentication not supported. The IT department gave me a Motorola router (bought in 2010) to factory reset. The guy who set it up quit and did not document the password. There is no reset button, and when connected to the serrial port, pressing the ESC key while booting for factory firmware when loading does not work until it is too late. From what I understand, the IT guy who set this up was a real IT genious. Motorola will not help me with it without paying for support. Now how should I write hydra command(Web form)? All that happens is firefox says connection is not secure and there is no way around this while the proxy is changed as seen in this tutorial. Cant connect so I cant use firefox thus I cant use burpsuite or crack logins. I would really appreciate if I could get some guidance. Since i began researching about brute-forcing and wordlist attacks i have been very wondering if "partial brute-force/wordlist attacks exist". A succesful brute-force attack against strong passwords may take hours, days and even weeks and it is undeniable that letting your computer operating for such long is not the best for the machine's health. And also if we take into consideration that most users do not change their passwords that often i think that diving your brute-force attempts could be a pretty good idea if you are not confident enough to let your machine operating 24/7. Isnt there a way to "pause" the brute-force attack either by saving the line of the wordlist that you have stopped or maybe saving the last combination of characters and its length so you dont need to begin brute forcing again from the start? However if there are more than 2 input fields other than USERNAME and PASSWORD Such as DATE OF BIRTH would burpsuite work - if I have all these wordlists ????? i have configured icewasel and burpsuite as you have mentioned but my page just loads and finished when burpsuite has gotten nothing. can someone give me the solution to it? Would it be reasonable to use these brute Force methods on the admin cPanel of a website? If not, what other appropriate alternatives are there? Great article what if the login failed message is cookies based. What to do then ? how to proceed further ? My DVWA is at 127.0.0.1. What should my Proxy be?